antenna rotation: 0 to 15 rpm. The AN/TPS-44 is an air surveillance command and control radar used to locate and identify airborne targets. It consists of an equipment shelter and a foldable antenna, and is transportable by two M35 trucks, rail, helicopter sling lift, or C-130 cargo aircraft. The set is a component of the Forward Air Control Post (FACP), which is part of the Tactical Air Control System used to support worldwide tactical operations during limited war or other contingencies. 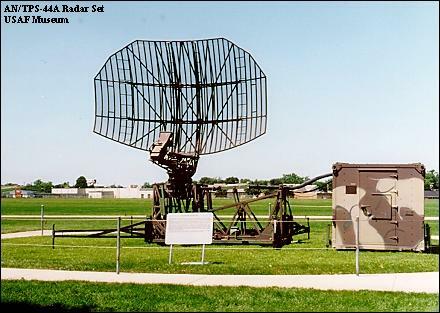 Radar sets of this type were used in Southeast Asia to control tactical aircraft on close air support missions. In FACP operation, the AN/TPS-44 works in conjunction with an operations central, a communications set, and a troposcatter radio set. The search radar includes position and range indicator displays, anti-jamming features, and other systems to provide extra clarity and long-range target detection capability. The radar set also contains Identification Friend or Foe (IFF) equipment for aircraft identification. Solid-state circuitry provides increased system reliability and reduces maintenance down-time. The AN/TPS-44A is in service with the USAF and in other countries include Argentina where the radar is said to be located at naval or air bases in or near Buenos Aires, Port Belgrano, Comodoro Rivadavia, Santa Cruz, Rio Gallegos, Rio Grande and Ushaia.